Did NTIA notify Congress it unilaterally changed the IANA functions contract? 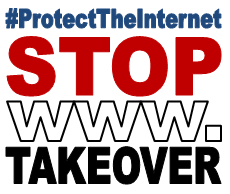 On August 4, the National Telecommunications and Information Administration (NTIA) quietly modified its ongoing contract with the Internet Corporation for Assigned Names and Numbers (ICANN) governing that organization’s administration of the Internet’s domain name system. We say quietly because the change was not publicly announced by the agency via any press release, blog post, or otherwise, which modifies the extension options of the contract. NTIA Administrator Lawrence Strickling even wrote a blog post on August 4 about the Internet governance transition to ICANN removing government oversight of the domain name system’s Internet Assigned Numbers Authority (IANA) functions, but he failed to mention that the contract had been modified. 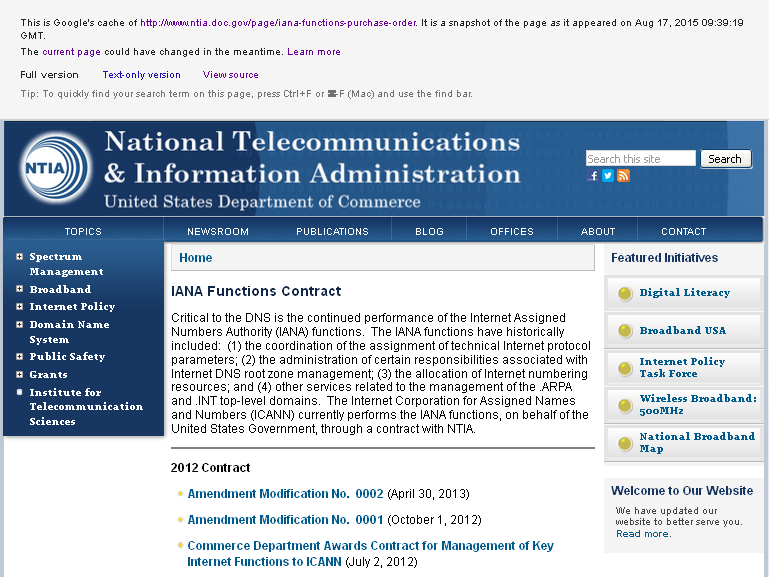 Interestingly, on the agency’s IANA functions contract page, you can now find a link to the amendment, titled “Amendment Modification No. 003.” However, using Google’s cache function, the contract amendment still had not been posted at least as of August 17. As for the change itself, under the original contract, NTIA could extend the term on a short-term basis for up to six months, or for two-year periods ending September 30, 2017 or September 30, 2019. Now, under the change, the extension can occur through September 30, 2016. Strickling finally announced the contract extension on August 17, but he again failed to note that the reason he was able to perform this particular extension was because the contract had been modified. Note that Strickling writes, “We informed Congress on Friday,” which was August 14 of the contract extension. So, this raises the question: Did NTIA even bother to tell Congress that it had modified the contract with ICANN? If the answer to the aforementioned question is no, or if only a few key members of Congress were apprised of the change to the contract, leaving the vast majority of members in the dark, here’s what members need to know. Under federal regulations, NTIA can just change the contract willy-nilly, even though it was supposedly an open bid contract. So even though the agency has said it is doing a one-year extension, which on the surface looks like a victory for those who oppose the Internet transition, the agency apparently can just come back and change the contract again. And Congress may not find out about it until it’s too late. That is, unless Congress defunds the transition now in the continuing resolution or omnibus legislation for fiscal year 2016, as they did in the current fiscal year. Otherwise, there will be nothing to prevent the transition from occurring prior to the contract ending, or when it ends, now set for September 30, 2016. Initially many observers were optimistic about the time that a one-year extension seemingly affords policymakers to consider or block the Internet giveaway. Now, it is of little comfort when NTIA can just unilaterally change the contract on a whim. The Internet giveaway should be defunded permanently until it is positively authorized by an act of Congress — before it is too late to do anything about it.